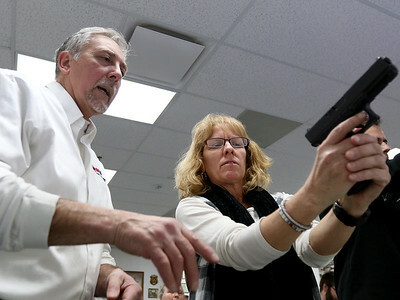 Tom Dorsch (left), Director of Operations at On Target Range, helps Tinley Park special education teacher Tiffany Mucha learn to use a handgun during a free class for school employees at On Target Range on Monday, March 26, 2018 in Crystal Lake. 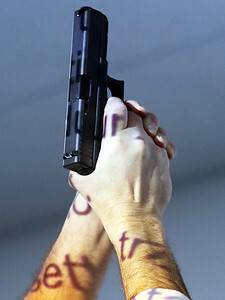 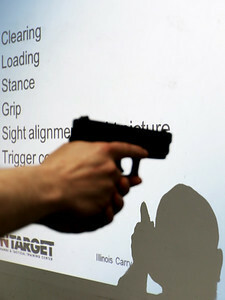 Tom Dorsch, Director of Operations at On Target Range, holds up a handgun into the light projected on a nearby screen during a free class for school employees at On Target Range on Monday, March 26, 2018 in Crystal Lake. 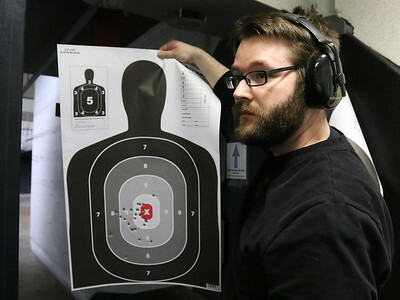 School employees who wished to not be identified practice with their guns during a free gun training class for school employees at On Target Range on Monday, March 26, 2018 in Crystal Lake. 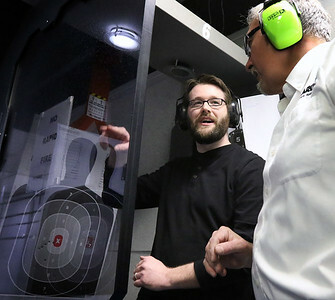 Brian Pacheco, a school district employee at a northern Illinois school, shows his gun target to his instructor during a free gun training class for school employees at On Target Range on Monday, March 26, 2018 in Crystal Lake. 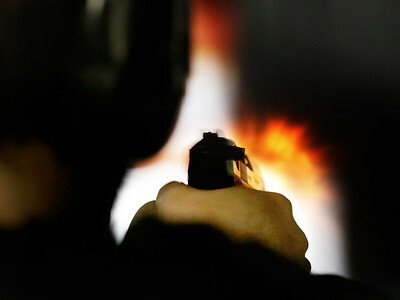 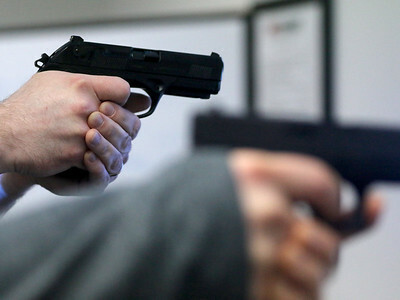 A bullet blasts out of the chamber of school district employee Brian Pacheco's handgun during a free gun training class for school employees at On Target Range on Monday, March 26, 2018 in Crystal Lake. 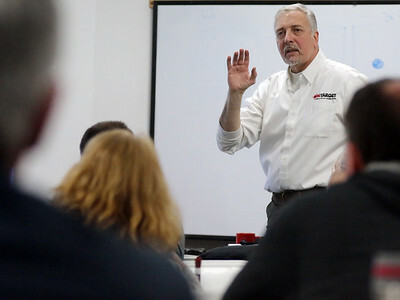 Tom Dorsch, Director of Operations at On Target Range, instructs his pupils during a free class for school employees at On Target Range on Monday, March 26, 2018 in Crystal Lake. 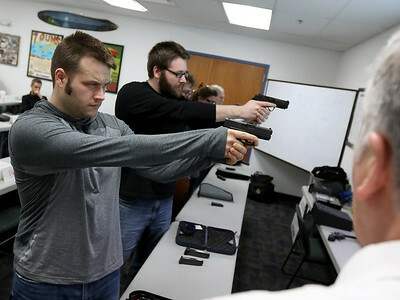 Brian Pacheco (left) and brother Brandon Pacheco practice with their guns during a free gun training class for school employees at On Target Range on Monday, March 26, 2018 in Crystal Lake. 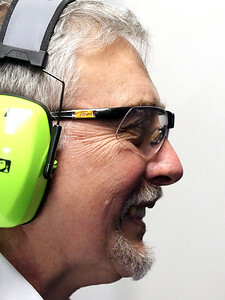 Tom Dorsch, Director of Operations at On Target Range, smiles as he helps students in his free gun training class for school employees at On Target Range on Monday, March 26, 2018 in Crystal Lake. 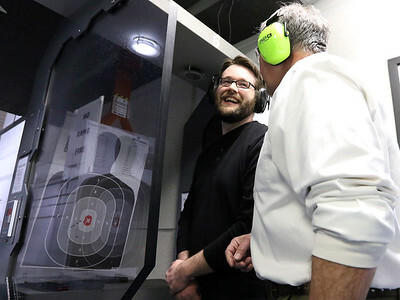 Tom Dorsch (right), Director of Operations at On Target Range, talks with Brian Pacheco, a school district employee at a northern Illinois school, inside the gun range during a free class for school employees at On Target Range on Monday, March 26, 2018 in Crystal Lake.